James was born in July 1829 in Tennessee. He was the son of George Washington Starr and Elizabeth Jackson. James married Gelina Battenfield on July 28, 1850 in Pope County, Arkansas. She was the daughter of Joseph Battenfield and Sarah Jane Miller. James was a farmer and a blacksmith. The 1860 census records show that James and Gelina lived in Hardin, Conway County, Arkansas. 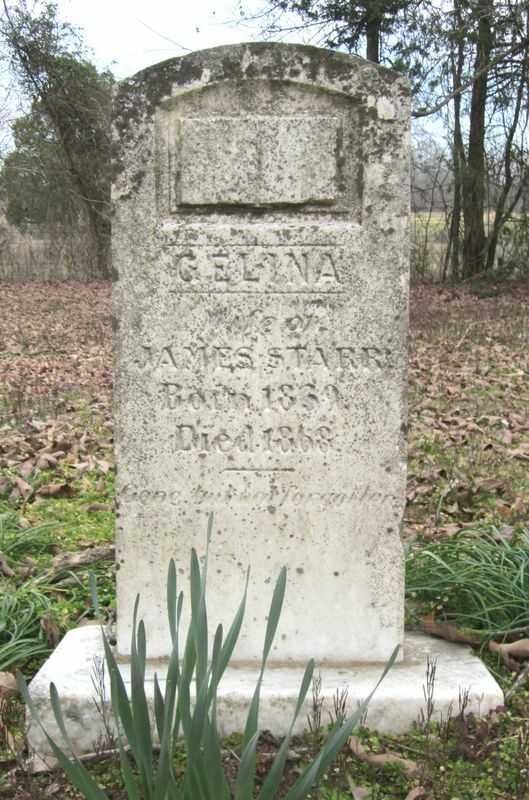 Gelina died in 1868 in Enola, Faulkner County, Arkansas and is buried in Siloam Cemetery, in Faulkner County, Arkansas. James married Sarah Millie Hicks on June 14, 1868 in Pope County, Arkansas. She was born about 1840 in Missouri and died about 1882 in Arkansas. James married Martha J. Chamness on January 03, 1886 in Faulkner County, Arkansas. Martha was born in August 1850 in Faulkner County, Arkansas. James died on January 19, 1910 in Mt. Vernon, Faulkner County, Arkansas and is buried in the Siloam Cemetery, Faulkner County, Arkansas. James was killed in his blacksmith shop by fullbloods [Cherokees] who were opposed to the signing of the New Echota Treaty [NOTE: The New Echota Treaty was signed in 1835 in Georgia which ceded Cherokee land to the US Government for compensation. This started the infamous Trail of Tears where the Cherokee Nation was forcibly moved from Georgia 1,000 miles to Arkansas and Oklahoma. In discussing the early history of this part of the country, and its settlement, we have to bring in just a bit of history. Where we are now was a part of Missouri territory until 1819. We were a part of New Madrid County, and this county reached from New Madrid, Missouri, to the north Louisiana line. Louisiana was made a state in 1812, Missouri in 1819 and Arkansas in 1836. The principal settlements in Arkansas in 1819 were: Davidsonville, Arkansas Post, Cadron, Hopefield, Camden, Helena, Washington and Little Rock. A few settlers were scattered around Pine Bluff, Batesville, Grand Glaise, Giltrough and Jacksonport. November 20, 1819, was the first election of any kind in Arkansas. On February 4, 1820, the county sear of Pulaski county was moved to the mouth of the Cadron, to the town of Cadron, and what we now call Cedar Park. Little Rock was made the state capitol in 1821. At that time, it only had one store, with very scanty supplies, but with a large supply of “Old Bald Face”. By 1825 the Greathouse Home was already built at what we now call Liberty. It was 38 miles north of Little Rock and 8 miles east of what is now Conway, on the Little Rock and Clinton road, which were by Holland, by Jonathan Hardin’s house, by where my great grandfather Ingram later lived, and on to Clinton. It joined the Batesville road there. The Searcy-Springfield road crossed this road at Jonathan Hardin's house. The Des Arc-Lewisburg road came by El Paso, which was called Peach Orchard Gap in those days; by Bristol, a mile south of Enola, on by Union Valley Church, and joined the Little Rock-Clinton road at the Bowie place. Most of the early settlers in this part of the country, settled on or near one of these roads. I have heard all my life of the settlement of Jonathan Hardin at the Hardin Hill on the Cadron. What has intrigued me even more is “Who were the next settlers”? In this connection, you must remember that roads were almost nonexistent, in those days. The first road of any kind to touch Faulkner county anywhere, was the Little Rock to Cadron road in 1807. Cadron was one of the early post offices, having been established in 1820, with Eli J. Lewis as the Postmaster. Cadron was dying out in the late 1820’s and the office was discontinued. The people around what is now Conway then got their mail at a new office called Green Grove. It was near where Bill Ross now has a store. Cadron was reestablished in 1848 and the office was at Jonathan Hardin’s house in 1850. Census records for 1860 show it at Greatgrand Pa Ingram's post office. About his same time, we had an office at Caney Creek. It was about a mile and a half southeast of Enola. Muddy Bayou township reached from Mt. Vernon to the Cadron, and south of the Searcy-Springfield road to the Bayou. North of this road was Benton Township and it reached north to Quitman and Heber Springs. West of the Hardin hill to about 5 miles west of Greenbrier was Hardin Township. East Fork was south of that and Cadron was south of East Fork. Mail service in those days was even worse than it is at present. You had to go get your mail, when you though you might have some, and you had to do that until 1904. There was no RFD service at Enola until Sept. 17, 1914, and Marvin Matthews was the first carrier. The first steamboat to go up the Arkansas River, by Toadsuck, was the Eagle in 1822. The worst river accident that ever happened on the Arkansas River was the Lewisburg in 1820, when the boilers blew up on the Cherokee. It was bound for Ft. Gibson. It sank in 15 feet of water, with 17 killed and 20 seriously wounded. I offer these bits of history just to show what a primitive state this country was in, which our forefathers began in the 1830’s. The families that I will discuss settled within five or six miles each way of Enola. If I overlook some early settler, or make you kin to the wrong person, it's just and error on my part. Lots of early history is very hard to prove. …………… James Starr from Tennessee settled about a mile north of Centerville in 1845. His father G. W. Starr, and settled at Starr Gap in 1843. 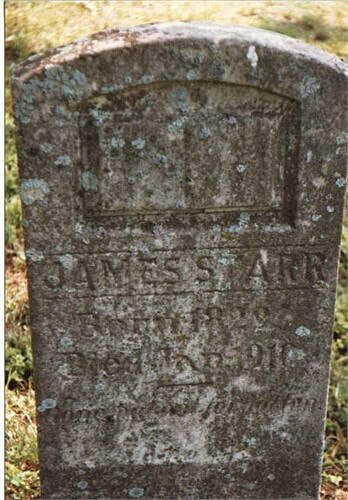 James Starr was the father of Jack Starr, and Jack Starr married my great aunt, Elizabeth Ingram ca 1861. She was the mother of “Bible Back” Jim Starr, and died at his birth. ………………. Some of the folks who lived around Enola in the 1880’s were: Steve Lamar, Johnny Cummings, Jim Reynolds, Jess Reynolds, Jim Reynolds, Jr., Dr.Jess Reynolds, Jimmie Cunningham, Bell Martin, Jeff Middleton, the Mungers, Colonel Harper, Sam Morris, Sam Joslin, the Samon’s, the Shocks, the Matthews, Belton Setzler, David and Jonathan Hailey, John Austin, Joseph and George Dalton, Usley Smith, A. A. Wilson, Dr. Terrell Bryant, Willis Gunter, Jap and Jack Starr, Man Smith, Anthony Brady, Tom Grimes, Spanker McGlone and the Bailey’s. Lots of these I never heard of and many I have left out. ………….. Lots of early settlers around Enola paid no taxes at all for 15 or 20years. These men paid these amounts in these years and its is all they did pay. This is from the official Conway county tax records. In 1840, Granville and Tillman Hogue paid $.50 poll taxes. In 1841 Coney Brady paid $4.20. In 1842 Sampson Adkisson paid $.97, Francis Patrick Henry paid $.75, and Richard Middleton paid $1.05. In 1843 David, Henry, and Stephen Heffington, Elijah and Gibson Hogue, G. W. Starr and W. Terrell each paid $.50 poll taxes. In 1845 Dr. Anthony Hinkle paid $.86, and Thomas Heffington paid $.90. And that's all they paid for these years.